Towards the end of the meetup on Tuesday night a couple of young men, actually college boys my son’s age, asked about our group. They were also interested in the hats that one member makes and sells. Times are tough and she sold a couple for not much more than the cost of the yarn, saying afterwards the she could use the money for gas. Last year she sold the same style for 4 times as much, this year has been really hard as we all know. 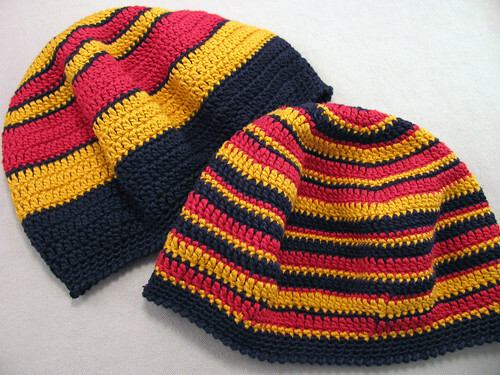 Her hats are really nice and make good snowboarding hats which is what the guys wanted them for. 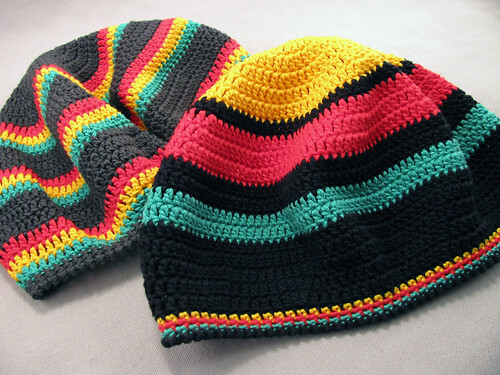 They asked if she had any Rasta hats, meaning yellow, black, green, and red, the colors the the Jamaican flag. My friend started to laugh at me. I decided to make some of the hats for my son when he was in high school. He was a very talented musician then and played in so many groups around Los Angeles. Well I knew the style, but because I lacked the cultural experience I didn’t know they had to be a specific color combination. I made two in as in the first photo. Finally I was able to find the Tahki cotton yarn I liked in the appropriate colors and was able to get close with some dark grey yarn. I ordered some black and finally made one with the leftover red, yellow and green as in the second photo. The part I think make these hats nice is I put a reverse single crochet border around the bottom edge. It took me a while to master that stitch; it is one of my favorite edge finishes now. And while I am writing about cotton crochet hats, I think I’ll share a little experiment I tried. 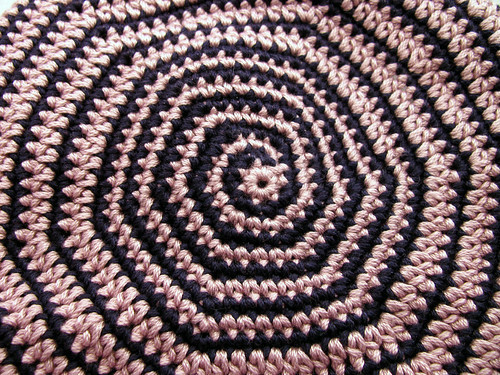 I wondered one day if I could crochet an increasing spiral pattern on the top of a tam. The pattern still needs work, like staggering the increases to make the curves rounder. I also think instead of keeping the darker color the same width throughout I need to find a way to make it wider at the beginning and decrease it as the lighter color increases. There needs to be a more striking change in proportions for the effect to be noticed. I ran out of navy yarn and the experiment is now waiting to be frogged and used for something else. This entry was posted on Thursday, January 8th, 2009 at 3:00 am and is filed under Crochet. Tagged: Clothing, Crochet, Hat. You can feed this entry. You can leave a response, or trackback from your own site.